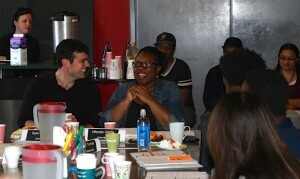 ‍Ryan Purcell and Mfoniso Udofia share thoughts about Sojourners with the cast, creative team, Magic staff, producers, supporters and Laney students. Sojourners is the first of our two productions, (the other, runboyrun, starts rehearsal next week!) that will run in rep, from Mfoniso's nine-play cycle. Sojourners is the origin of the cycle that tracks the Nigerian-American Ufot family in the U.S.
Ryan Purcell, who is directing Sojourners, reflected on the way the play captures a fearlessness and loneliness of leaving home and trying to build a home as an experience that all of us can relate to. All of us have left home at some point, or should have, and it is a scary and funny experience. Mfoniso mentioned the fascinating way that Sojourners, in its recent New York premiere, offered a distinct experience for Western versus Nigerian audiences. Those audiences laughed at very different moments and rooted for different characters.